Use for connecting anything to Snaplocs (E-Track singles) and E-Track in trucks, trailers, garages and more. Use with our optional slip on Hook and have an easy to use positive lock on one end and a hook on the other. Can also be used for Inter-Connecting multiple Snap-Loc Dollies together in any direction. Perfect for connecting back to back Platform trucks for moving long items like pipe, lumber and more. Heavy duty 2 inch wide Polyester strap webbing easily achieves the 4,400 lb. Break Strength rating (1,467 lb. working load). Made in the USA! Conveniently short 12" Logistic E-Strap connector for "Snaplocs" (E-Track Singles) and E-Track. Zinc plated Positive Locking E-Fitting ends. Use for Inter-Connecting Snap-Loc Dollies. 4,400 lb Break Strength (1,467 lb working load). KEEPER<sup></sup> heavy duty ratchet tie-downs are engineered to meet D.O.T., California Highway Patrol, and Web Sling Association standards, making them the ideal choice for industrial cargo control. KEEPER<sup></sup> tie-downs are appropriate for a wide variety of applications, and a Safety First approach delivers outstanding reliability in every circumstance. Hi-Test<sup></sup> webbing is abrasion-resistant, won't rot or mildew, and maximizes strength while remaining lightweight and transportable. Easy to use ratchet handles and J-hooks allow for secure, high-tension transport, making ratchet tie-downs perfect for your large, demanding cargo needs. KEEPER<sup></sup> 30' x 2" heavy duty ratchet tie-downs are engineered to meet D.O.T., California Highway Patrol, and Web Sling Association standards, making them the ideal choice for industrial cargo control. KEEPER<sup></sup> tie-downs are appropriate for a wide variety of applications, and a Safety First approach delivers outstanding reliability in every circumstance. Hi-Test<sup></sup> webbing is abrasion-resistant, won't rot or mildew, and maximizes strength while remaining lightweight and transportable. Easy to use ratchet handles and chrome J-hooks allow for secure, high-tension transport, making ratchet tie-downs perfect for your large, demanding cargo needs. KEEPER<sup></sup> Ratcheting KargoBar expands from 40" to 70" in length for maximum versatility in meeting your transport and storage needs. These cargo bars are ruggedly constructed to ensure that they can withstand tough conditions and unexpected stresses. Silver vein paint is "baked on" for increased durability, withstanding weather, resisting scratching and extending the life of the product. With large rubber grip pads, KEEPER<sup></sup> provides security and ease of use for efficient cargo management and organization. KEEPER<sup></sup> adjustable cargo bars are ideal for keeping your belongings in place in a wide range of cars, vans, and trucks. With its strong, bendable wire interior and sturdy rubber exterior, the Nite Ize 12" Gear Tie is the perfect size for bundling, connecting, and organizing everything from workshop tools to children's toys. With a simple wrap-and-twist motion, it keeps appliance wires, cables and cords tangle-free, organizes tools, art supplies, and sporting equipment, binds and neatens kitchen gadgets, craft supplies, toys, and more. Reusable, water-proof, available in 2 packs. 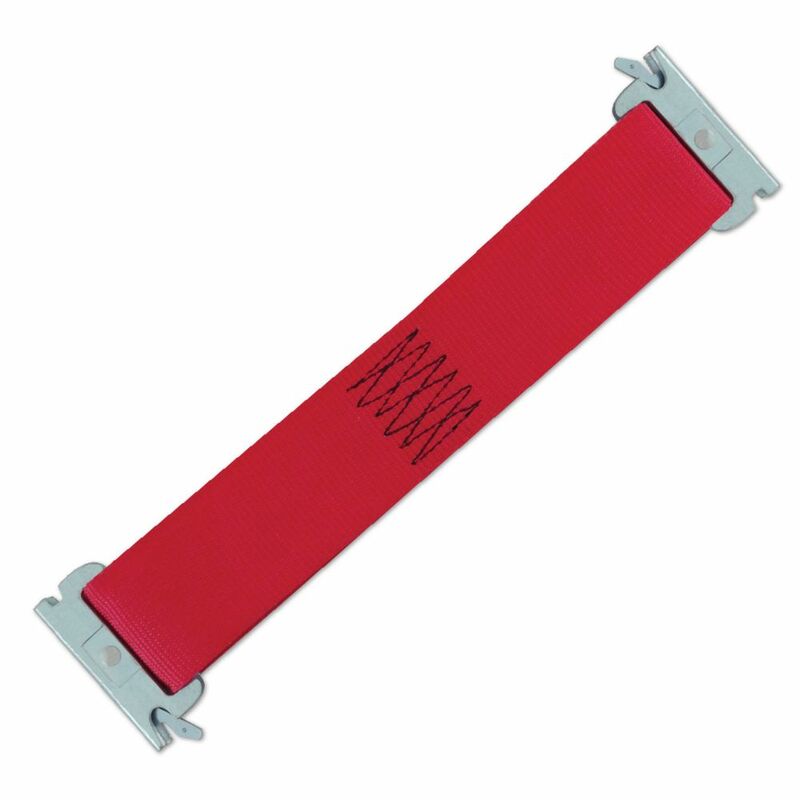 Snap-Loc Multi-Use 2"x12"E-Strap Red Use for connecting anything to Snaplocs (E-Track singles) and E-Track in trucks, trailers, garages and more. Use with our optional slip on Hook and have an easy to use positive lock on one end and a hook on the other. Can also be used for Inter-Connecting multiple Snap-Loc Dollies together in any direction. Perfect for connecting back to back Platform trucks for moving long items like pipe, lumber and more. Heavy duty 2 inch wide Polyester strap webbing easily achieves the 4,400 lb. Break Strength rating (1,467 lb. working load). Made in the USA!